We review all the latest and best deep fat fryer systems on the market, to give you peace of mind that you will be choosing the right product for your home. Below, in the table, the best deep fat fryer UK reviews start with the most highly rated first, then descend accordingly. For people who are in a hurry, you can use the table. For people who want a more in-depth review, you can scroll further down the page, where we provide all the pro's and con's for each. The Breville ​Deep Fat Fryer is the best easy clean deep fat fryer on the market thanks to its safe, easy, and smart way of deep frying at home. It’s digital timer and large window for viewing allows you to have complete control over how your dinner turns out. It’s big enough to fill the needs of the whole family and friends. It’s considered the best easy clean fryer because of its removable enamel bowl, stainless steel trim, and gloss white finish. It leaves no residual oil smells or marks. The oil in this fryer heats up very quickly, allowing your food to get done very quickly as well. And a deep fat fryer with removable bowl, stainless steel trim, and gloss white finish that is easy to clean. 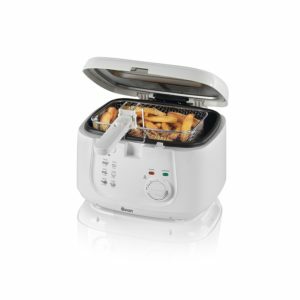 The Breville Easy Clean Deep Fryer has a filter that helps reduce the smell of frying in the home. The lid allows for minimal splatter, and the viewing window helps tell you when the food is done. The timer for this fryer has been noted for making a notable noise. For some it’s annoying, others can get over it and actually find it useful. 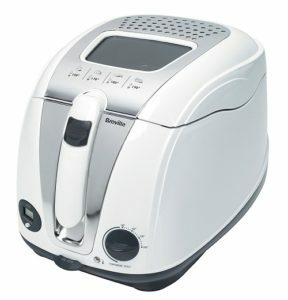 The Delonghi Deep Fryer is the one of the best chip fryers on the market right now. This appliance is great for fried food lovers who hate the cleanup. The Delonghi F26237.W Deep Fryer has a built-in “Total Clean System” which allows parts to be easily removed, and they’re nonstick. You can adjust the temperature easily with the horizontal adjuster, while safely touching the sides of the fryer as it has a cool touch body. The size of the fryer makes it the absolute best among chip fryers right now. People often compare it to i​ts healthier brothers. You can read our review of the best air fryer to compare yourself. This deep fryer has both a steam and odour filter that any user can remove with ease. It can be washed along with the other detachable accessories and is as good as new after a wash. The fryer is easy to use no matter your previous experience with fryers. You just pop whatever you’re frying in, adjust the temperature as needed, and use a timer to determine when your food is done. A few buyers have complained the fryer doesn’t reach an efficient heat to fry a decent chip, but those who have contacted customer service have received a replacement that works fine. The Tower Dual Basket Deep Fryer gets its title of best double deep fat fryer thanks to the ease and efficiency that users experience when they use it. It’s ideal for family favorites like chips, onion rings, battered fish, and so many other delicious foods. Both fryers are 3 litres, making it perfect to use to make meals for a family dinner or create snacks for gatherings of friends. The inner pots are removable and dishwasher safe, allowing for a quick cleanup. The practicality and ease of use are what makes it the best double tower deep fat fryer on the market. Those who love to cook in the kitchen, this appliance would be a must! Using 3600W, this deep fryer can reach up 190 degrees on each side, allowing you to quickly cook your meals. Each pot has separate heating elements so you’re able to cook multiple things at different temperature with ease. Many of the elements of the fryer are detachable so you can wash them without worry of an electrical hazard. The stainless exterior lets you efficiently clean the surface with only a cloth. A couple of people who’ve purchased this product have noted that one of the fryers stopped working shortly after a few uses. If returned within warranty then you’ll be able to exchange for a new one. The ​Tefal FR80404 Oleoclean is the best deep fat fryer in the UK overall, thanks to its ​design and all the extra bells and whistles that come with it. I​t has an enhanced oil temperature heating system, meaning that there is minimal oil absorption by sealilng the foods exterior for healthier fried food. This system also delivers cooking results that are deliciously crispy on the outside and juicy on the inside. ​Another one of the great feautres of this fryer is that it uses a world patented automatic oil filtration system, giving you clean oil every time to cook in. 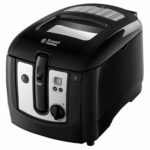 It’s versatility, convenience, and results are what makes the Tefal FR80404 Oleaclean the best electric deep fat fryer overall on the market. It also comes with a timer to ensure you don't cook your food for too long. The Multifry is designed so that you don’t have to do any work. All you need to do is find the recipe, add the food, add the correct amount of oil, close the lid, and let it cook for the appropriate amount of time. The Surround Heating System allows the food to be evenly cooked from every side and from top to bottom. ​As mentioned above this technology allows for clean frying every time. When you are finished cooking using the oil that is present in the fryer. 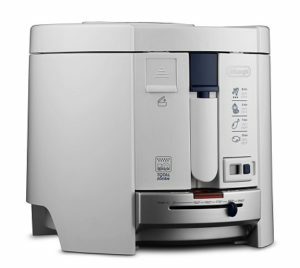 It automatically filters out all the bits from the oil into a box underneath, giving you fresh clean oil for every use. While this is the best deep fat fryer on the market, it does also show in the price tag. It is a little more than the other models, but the technology it uses and the money you would save by being able to constantly reuse the oil soon makes up for it. 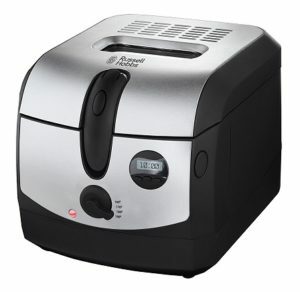 The best cheap deep fat fryer on the market right now is the Russell Hobbs Digital Deep Fryer 17942. The Russell Hobbs deep fat fryer 17942 is similar to the aforementioned Russell Hobbs 24580 in that it also has a 3.3-litre oil capacity and 1.2 food capacity. This fryer is easy to use and clean and has multiple temperature settings for you to cook your food to perfection. It has a shape that when paired with its size makes this fryer easy to store. It’s the perfect size for you to slip into the cupboard once you’ve finished frying for the day. The digital timer that this fryer is connected with pairs nicely with how quickly the oil heats up so you can have perfectly cooked food in a fast amount of time. The fryer is hard to disassemble and so are other parts which makes it more difficult to clean than other fryers. The best digital deep fat fryer is the Russell Hobbs ​Deep Fat Fryer. It’s equipped with an oil capacity of 3.3 litres and can hold 1.2 KG of food, meaning you have enough space in the large deep fryer to make an abundance of food. It’s equipped with a digital timer and a basket that is specifically designed to make getting your food out easy and safe. The digital timer allows you to easily and efficiently fry your food correctly, making it the best digital deep fryer on the market. The way it’s shaped paired with its size makes this fryer easy to store. It’s the perfect size for you to slip into the cupboard once you’ve finished frying for the day. The rate at which the oil heats up and the digital timer work to give you the perfectly cooked food in a short amount of time. It’s important to note that it’s not necessary to fill the oil to full capacity and doing so could impair you taking the basket out of the fryer. any have complained that the cable is too short which can pose a hazard in which you could easily knock the appliance over. This is an easily fixed issue. Just purchase an extension lead and you’ll be good to go. The Tefal Deep Fat Fryer is a semi-professional stainless steel deep fat fryer that is at the top of its game. It’s the best semi pro deep fat fryer on the market right now thanks to its compact deep fat fryer design but large capacity deep fat fryer to fit food. It can fry up to 1.2 KG of food at a time and is easy to clean. It’s immerse heating element properly fries food in a quick amount of time. The temperature for this appliance is easily adjustable and you can set from anywhere between 150 degrees to 190 degrees. The fast heating system and cool zone technology places the Tefal chip fryer as the best semi professional deep fat fryer. When crumbs normally fall into fryers, they make the oil dirty and cause the items that are fried to turn out a darker colour. The cool zone technology keeps these fallen crumbs from being burned, eliminating smell and enhancing the look of your food. The elements that heat the appliance is directly in contact with the oil in the fryer. It allows the oil to heat up at a rate that’s extremely fast. Many expected this fryer to be bigger, even though it does state that it’s compact in size. It’s not ideal for a large family but can still get the job done. The ​Swan S6040N Fryer is the best Family deep fat fryer​ due to it it's size. It’s a ​fryer that is made of stainless steel to assist in the ease of cleaning. It has an integrated ​variable temperature control to allow for frying any type of food. One of the best features of this model is it contains an automatic cut off and overheat protection for your safety. 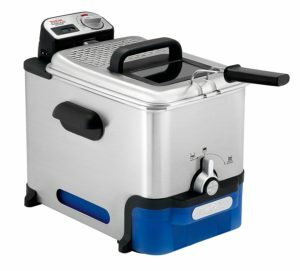 It has practical features, is easy to clean, and ​the fryer can hold 3 liters of oil. 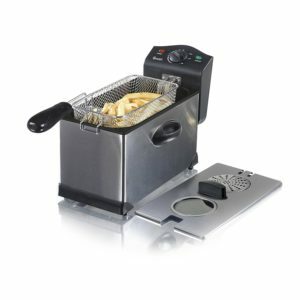 ​As mentioned above, this fryer is great for the beginner to use. Protecting you from the unit overheating. ​The variable temperature allows for cooking any type of food, from chicken to fish. T​he fryer doesn't have cool zone technology, meaning that any food that accidentally hops/ falls out of the basket will get burnt and taint the oil. The Swan Square Fryer really does give you the best bang for your buck, winning our best cheap deep fat fryer award. The oil capacity is 2.5L, which means it can hold about 1kg of food to be fried. It makes food that is big enough to feed your entire family and can even feed any dinner party. It features a non stick inner pan, meaning that this unit is extremely easy to clean. It’s ability to produce a lot of food that is well-cooked, making it the best cheap deep fat fryer out there. The ​Swan square fryer has the non stick inner pan, making it easy to clean. Not only can the ​Swan fryer hold a lot of food, it’s also ​has cool touch handles for easy carrying. 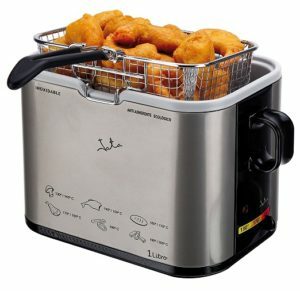 Although ​it is a great fryer, it doesn' feature cool zone technology. Meaning that bit of food that fall out of the basket will get burnt and ruin the oil for future use, rather than falling into a 'cool zone'. The Jata FR326 Non-Stick Ceramic Coating Deep Fat Fryer is the best small deep fat fryer on the market at the moment. It’s the only fryer of its size to be able to have the capacity to fit 1 litre of oil inside of it. It has a ceramic coating and a resistor that’s hidden to help facilitate cleaning. Its portability and how easy it is to clean make it the best mini deep fat fryer around. This deep fryer has a non-stick coating that is free of PTFE and PFOA. Paired with ceramic coating, this Jata fryer is extremely easy to clean. The mini fryer has temperature controls so you can get the perfect cook on your food. The glass lid allows you to see what’s cooking while it’s handle allows you to safely remove the lid. The sides of the fryer are also equipped with handles for easy transportation. The body of the fryer also features common meals you can make with it. The adjustment for the fryer ranges from 130 degrees to 200 degrees. On such a small device, it’s hard to set it at the precise amount of degrees you may want something to cook. The most ideal fryer for anyone to have would be the ​Brevile Easy Clean. It’s efficient with getting the best fried foods with the minimal amount of oil possible. It gives you healthier choices but great taste. It’s the most versatile of the options and allows you to cook other things. With this fryer, you’ll find yourself using your stove and oven less and less. Its heating system heats the oil up quickly that delivers the perfect crisp on the outside while leaving the inside of your food fluffy, juicy, or whatever consistency is the best for your food. The Brevile Easy Clean is the best deep fat fryer overall on the market. Is There A Recipe Book Included? A lot of people wonder if fryers come with recipe books since there might not be many recipes that you’re familiar with. Complicated fryers that can do more than just fry, like the Delonghi FH1130 Multifry, do come with recipe books. Tiny fryers also come with some helpful cooking instructions, like the Jata FR326 Non-Stick Ceramic Coating Deep Fat Fryer which has simple cooking instructions for things you can put in the fryer. Many people are worried about whether the fryer is worth the money that they’ll spend on it. Ways to help determine this is to look at the oil capacity for the system in relation to the food capacity. You’ll also want to look at how much electricity it takes to run. Each of these has an effect on the cost of maintenance and other factors that determine whether it’s an economical option. How Does The Fryer Turn Off? Some fryers have on and off buttons, some automatically turn off, and others you have to pull the cable from the wall. Many people prefer the automatic shut off and the button, although quite a few are ones you have to pull the cable so be sure to check the product descriptions to see if the power option suits you. The average oil capacity of a fryer ranges somewhere between 2 litres to 3.5 litres. The more oil it holds usually means the more food you can cook but can also lead to more of a mess and a longer wait time heating up. If it has removable parts, those parts are probably dishwasher safe but the appliance with the cable is not. Owning a deep fat fryer has many benefits that people don’t really think of. Deep fryers heat up oil faster than pots and pans do on the stove, which increases efficiency and allows you to put less effort and time into it. Other heating elements and technology that are being added to deep fryers make the process even faster. There are features built into fryers that aid in the ease of use as well as cutting back on the mess. Removing food items from pots and pans can get oil all over the stove and counters while using a fryer keeps the splatter minimum. Some fryers even feature a holder for the basket. Overall, fryers allow home cooks greater control over the frying process in their cooking. Pots and pans don’t come equipped with the safety features that many deep fryers have. Things like automatic emerging baskets, alarms, oil heat regulators, and oil temperature detectors ensure the safest environment for you to fry things in. These safety features will help you avoid harm and prevent any fires from breaking out. Deep fat fryers aren’t a cheap investment, and choosing the wrong one can result in a lot of money lost. That doesn’t mean that the right deep fryer for you isn’t out there. You just need to know what to look for before buying. A few things that you should consider before buying a deep fat fryer includes figuring out the right capacity for you. You need to know how many people you’re feeding. The amount of food capacity you need from a fryer is determined by this as well as how much oil you’ll need to use. Another thing to consider is how high powered you want your fryer to be. Fryers that require more power usually have a better heating unit to heat the oil faster. You’ll want to check to see if you want a fryer that is set to one temperature or has the ability to be adjusted. There are many questions that you should address as well before you bring a fryer home. You need to consider where you’re going to store your new fryer as well as examining whether you like to use different methods to cook. You’ll also want to consider if a fryer is the best option for you if you want to cut back on fats and decide whether you want to reuse the oil in the fryer or start with fresh oil with every use. It’s important to do your research and read other trusted customer deep fat fryer reviews or small deep fat fryer reviews when it comes to picking out the right deep fat fryer for you and your needs.